You're visiting the WordFly support site right now! Use the search bar to find answers to frequently asked questions and how-to articles. Submit tickets by emailing support@wordfly.com or clicking Ask a Question to contact us. Any user can create a WordFly support account to track the progress of current support tickets or review previous support tickets. You don't need an account to send in tickets, just email or call 206-728-7997 anytime to connect with us! Have you already emailed WordFly support? You have an account! Creating an account will allow you to see tickets you have opened with WordFly support. See the status of your tickets (open, pending, and solved), track progress of questions/requests/issues, or reference previous ticket resolutions. Use the Status dropdown to filter through your tickets. Open: This status means the ticket is in WordFly's court and we'll be getting back to you as soon as possible. Awaiting for your reply: This status means WordFly is waiting for you to give an update. Solved: This status means the ticket question/request/issue has been addressed and the ticket is no longer awaiting any replies from you or WordFly. Click over to Requests I'm CC'd on to see tickets you have been added to as a CC. Filter through tickets here as well. Anytime you have worked with WordFly support through email, you already have a WordFly support account set up. Once your email is in our system, it's just a matter of resetting your password to access your account. 2. Click Sign In from the header nav. 3. Click Get a password. 4. Enter your email in the email field. This will send an email to the email address you entered in. *You'll see a success message like this...Since you are an existing user, we are sending you an email with a link to reset your password. 7. Go to the inbox of the email you used for the sign up. 8. Open the reset email from WordFly Support. 9. Click on the password reset link in the email. 10. Enter in your new password in the password field then click Change Password. You're automatically logged in. Learn about updating your tickets and viewing previous resolutions. 12. Click on your name in the upper right corner and select 'My Activities'. This will take you to your requests with WordFly support. Learn how to update your tickets. Use this option if you have never emailed WordFly support before. 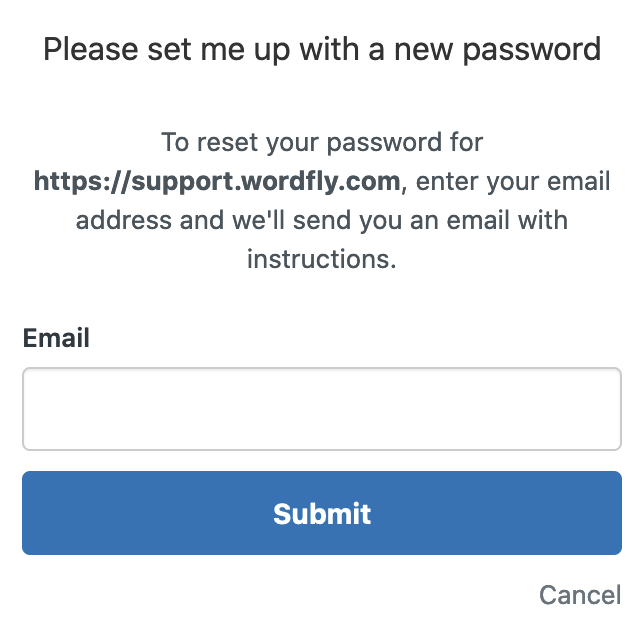 If you have worked with support@wordfly.com over email, learn how to reset your password to access your account. 3. Click Sign up from the Sign in window. 4. Fill out all the required * fields and click Sign Up. 5. Go to the inbox of the email you used for the sign up. 6. Open the email from WordFly support. 7. Click on the verification link in the WordFly support email. 8. You'll be redirected to a new window, enter a password for your WordFly support account and then click Set Password. 9. You have an official WordFly support account now! You're logged in automatically after setting your password. You can logout by clicking your name in the upper right corner then select Sign Out. 10. Click on your name in the upper right corner and select 'My Activities'. Once you have a WordFly support account created, you can see your open, pending, and solved tickets anytime. Login to see the status of your tickets and/or send updates. 1. Login to your WordFly support account from the support header nav. 2. Once logged in, click on your name in the upper right corner and select 'My Activities'. This will take you to your requests with WordFly support. 3. Under Requests, click on your ticket. 4. Add a reply to a ticket here! Enter your reply and click Add reply. You can also just reply to your ticket within your email inbox. Either way works!